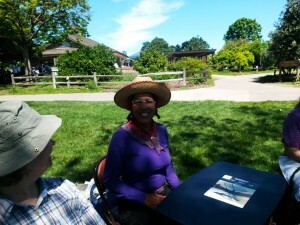 It was another wonderful sunny day at Emma Prusch Farm Park. We gathered in the shade under a tree a bit farther from the playground than usual. 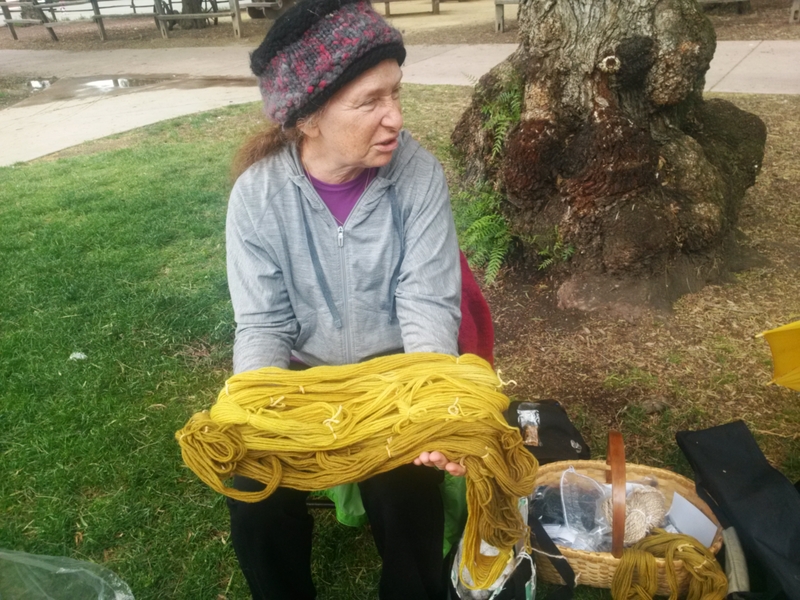 Before the business part of the meeting convened, we had a bit of discussion about where to get tools, fiber, and advice now that Purlessence is closing. For buying stuff, there are still events such as Stitches West in February, CNCH in some years, Spinning at the Winery in June, the Monterey Fair Wool Auction on Labor Day, the Boonville California Wool & Fiber festival in September (corrected date now in our Calendar page), and Lambtown in October. For stores in the Bay Area, we still have Carolina Homespun up in San Francisco (check dates or order online — they go to lots of events). Robyn recommended The Woolery as a good online option. Nancy Derham couldn’t attend this meeting so Lotus read from our latest bank statement for a treasurer’s report: $514.02 is our current balance. No one brought up any old or new business. 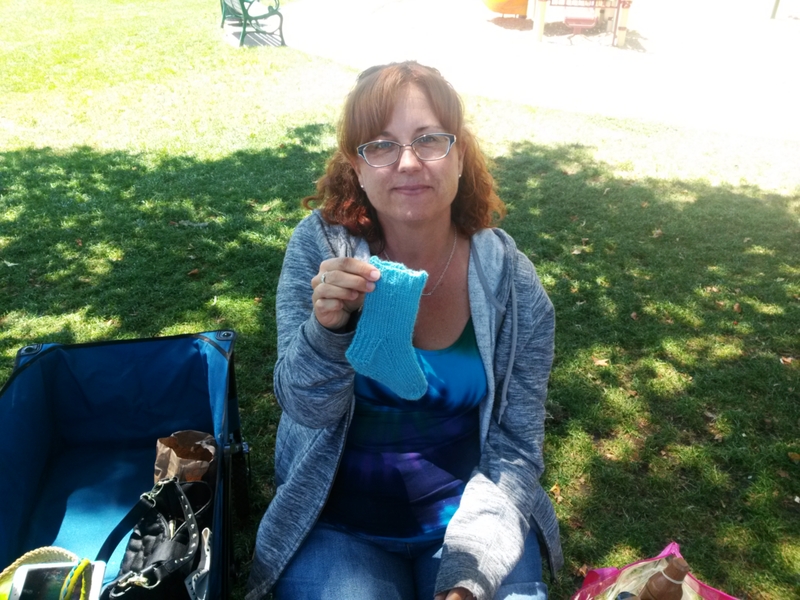 Kelly knitted her first sock — a child size blue learning project. 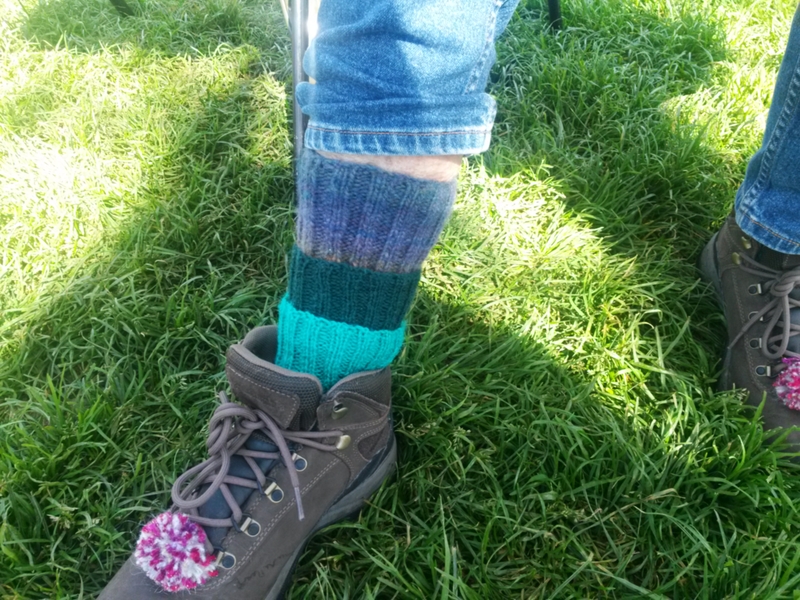 The sock was knitted from the cuff down. Robyn was busy the last week skirting fleeces shorn from her alpaca earlier this year. (As explained in the meeting: skirting a fleece means separating the prime fiber from the poor stuff, e.g. short fiber on head and legs or poopy fiber at the rear). Robyn walked around with the bag of black alpaca from Kissa to let us feel how soft it is. Robyn raises alpaca for a living. Kissa’s skirted fleece weighs 1 pound 4 ounces. She is selling it for $4 an ounce. Cheryl came with her current crocheting projects. She is working a stuffed bear. She came to the meeting with 2 legs and 2 arms. Over the course of the meeting, the legs came together and the torso grew. 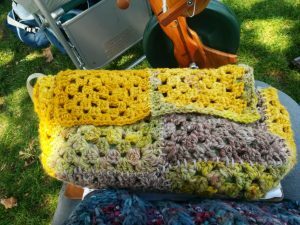 Cheryl also has been working on a ripple afghan. 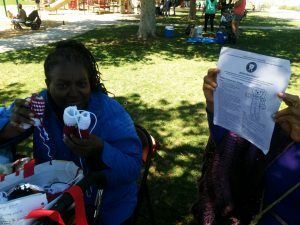 Cookie won 1st place for her yarn entry at the Alameda County Fair this year. 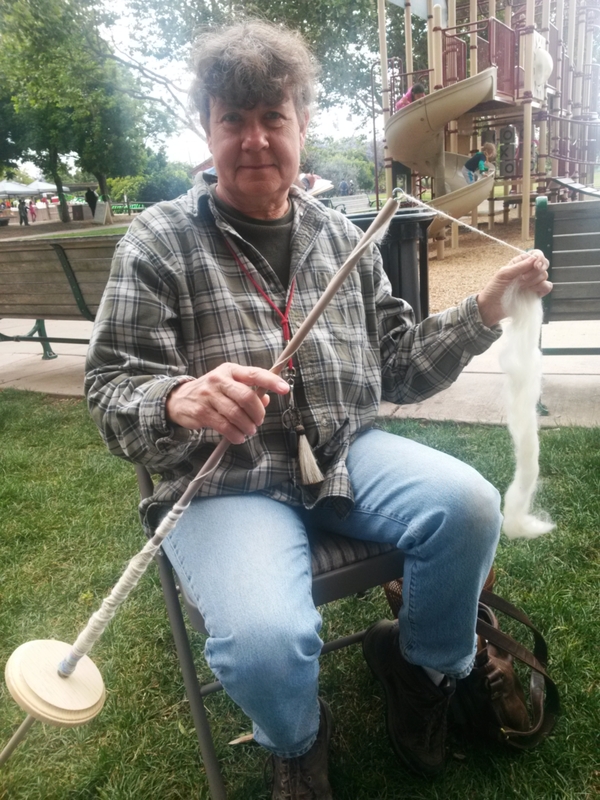 Cookie spent most of the meeting spinning silk on a small drop spindle made some years ago at a Serendipity meeting. The whorl was made from Fimo and features a face. Ginger has been busy sorting / disposing / rehoming the stuff in her garage. She asked if anyone had need of plastic page protectors or 3 ring binders. 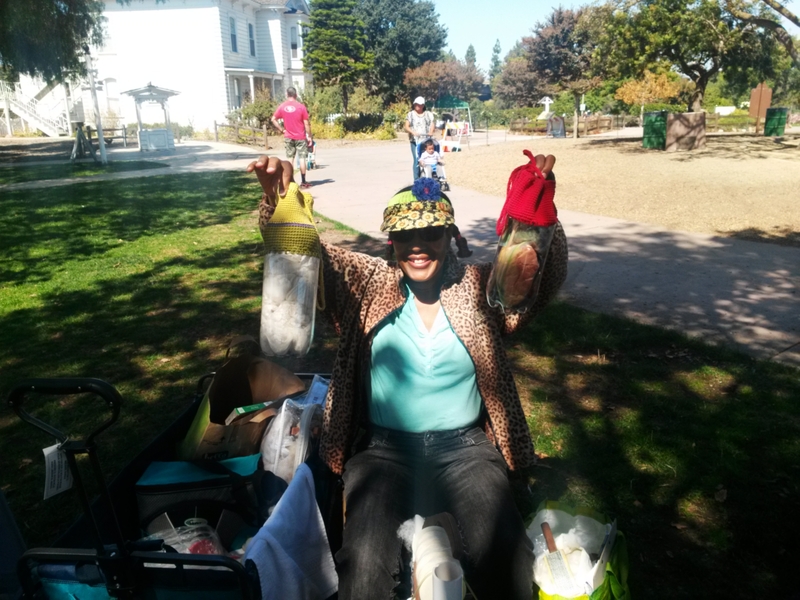 Several people said they could really use page protectors so Ginger is going to try to remember to bring a bunch of those she culled from her garage sort. Ginger is still spinning coarse gray wool. Patti has started to sew her granny squares together. She’s found that her stash of squares come in two sizes. The gold and white squares are distinctly smaller than the brown and heathery gold/brown squares. 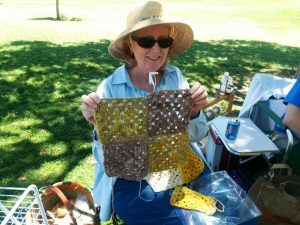 After consulting an expert and learning about different ways to join squares on YouTube, Patti bought some tightly spun many ply merino to use and is sewing her squares together. 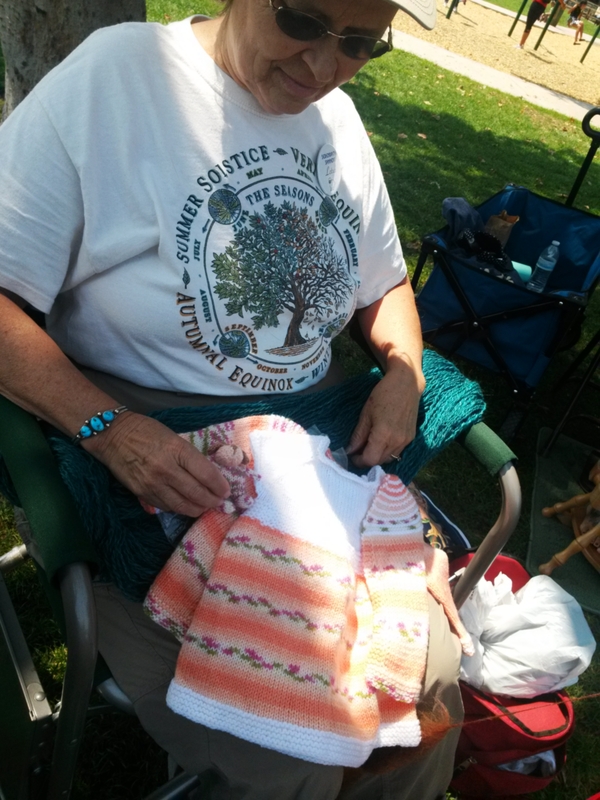 Update: Patti wore a blouse made of very breathable, extra UV resistant fabric. 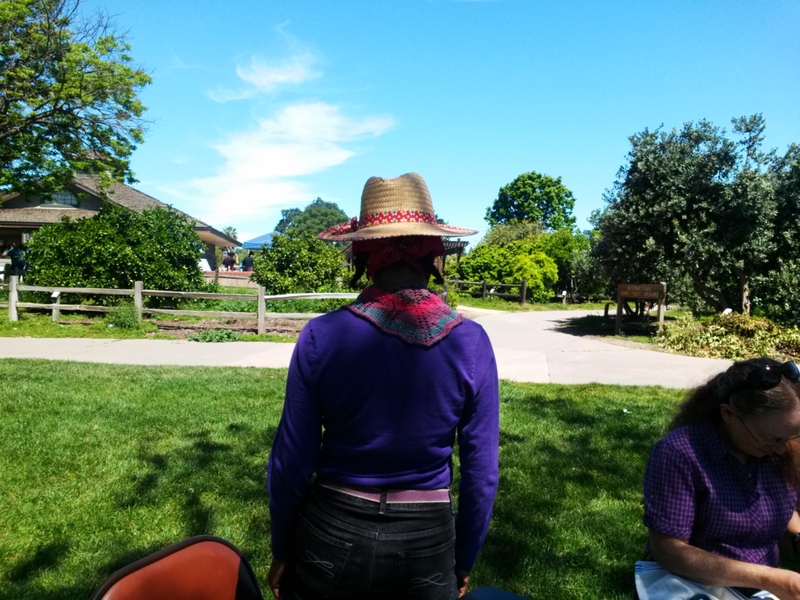 Since many of us go to outdoor fairs and such, she thought others would like to see what’s available to buy for sun protection. She provided details on the blouse after the meeting. The brand was recommended by by dermatologist. The site where she bought is www.coolibar.com. Carol brought in a box holding all of the yarn she’s plyed so far for the Lambtown Sheep-to-Shawl contest. The yardage at present is approximately 1800 yards. 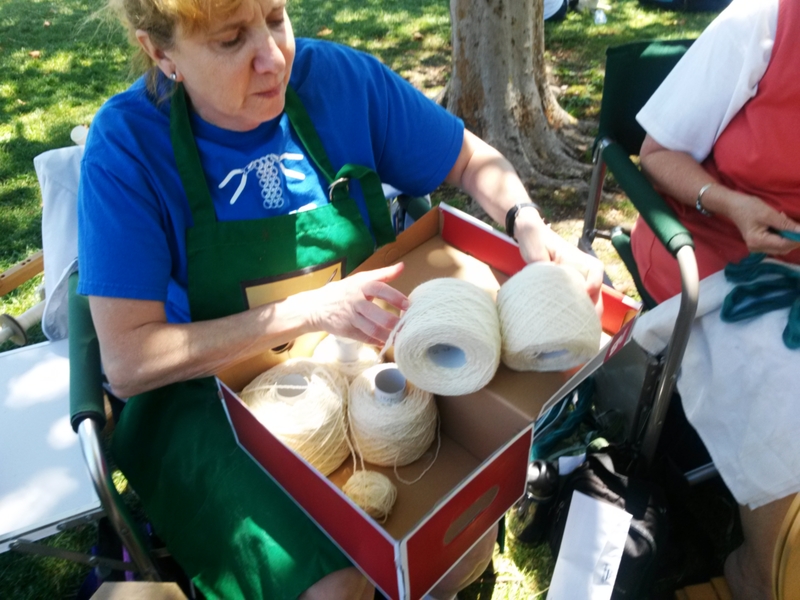 The yarn is 2 ply, with 1 ply spun by Ginger and 1 ply spun by various others on the team. Carol spun some of the singles too. 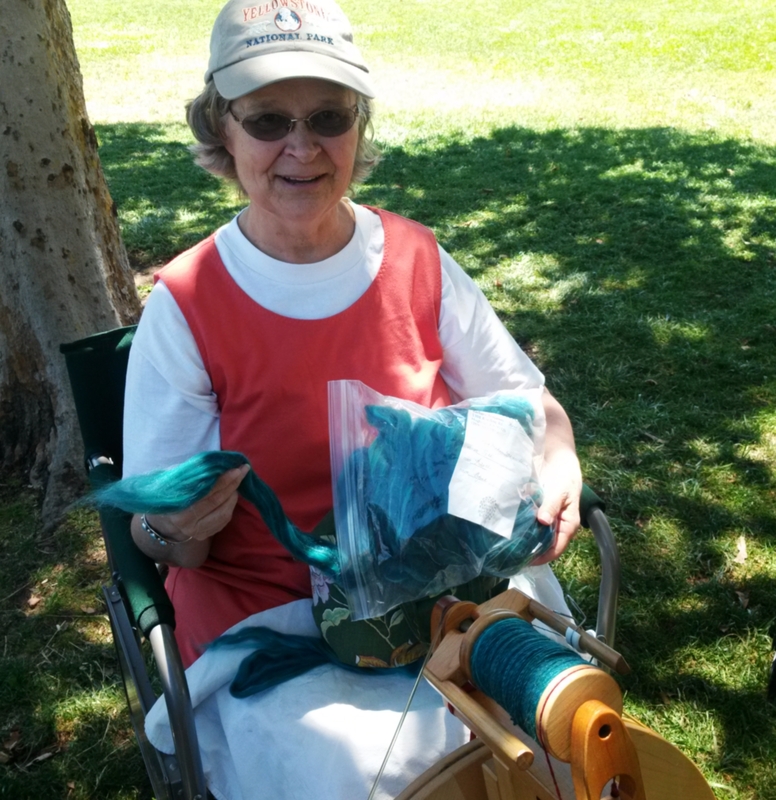 Carol gave us a secondhand status report on spinning at the Scottish Highland Games in Pleasanton. The games are a yearly event at the Alameda County Fairgrounds. 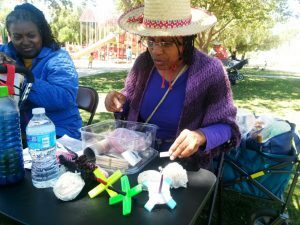 Lynn and Sue Duffield in the past pulled together a booth and spinners to demonstrate and provide hands-on experiences for children. This year, they needed a bit of a break and didn’t get paperwork in for a booth before the deadline. So while you can buy tickets and go on your own, perhaps showing off your drop spindle skills as you tour the event, it looks like there probably won’t be any organized demonstration this year. If you are in to old style sailing ships: Carol gave us a heads up that the Lady Washington will be back in the bay area in November. Lotus is trying to whittle down her cloth and fiber stash. She has been busy sewing herself new clothes out of her fabric stash. The salmon colored dress she wore to the meeting was newly sewn from her stash. 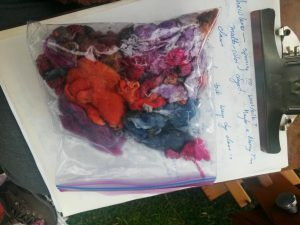 Lotus brought a well aged bag of fiber purchased many years ago from Barbara Benjamin in her stash to spin at the meeting. Lotus has also been working to reduce her yarn stash. 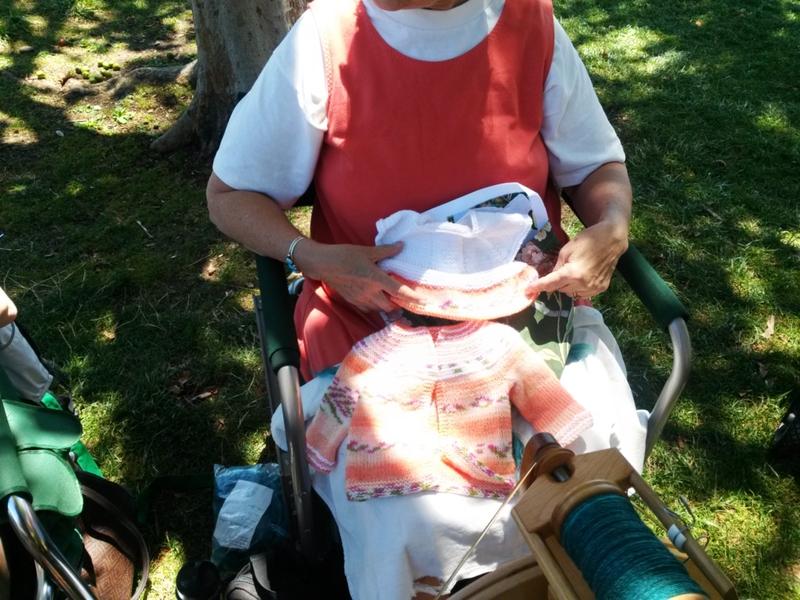 She showed us a baby sweater and an in-progress baby dress knitted using a self-striping yarn from her stash. This entry was posted in Uncategorized on July 17, 2016 by Aviva Garrett. The weather was beautiful, although only a few of us showed up. We didn’t really hold a formal meeting so this write-up is based on snippets of conversation and informal show & tell. Lotus came with her family — her husband, her son & daughter-in-law, and her cute little granddaughter. Lotus gave Ginger a bank statement to pass on to our treasurer Nancy at the next meeting where both show up. 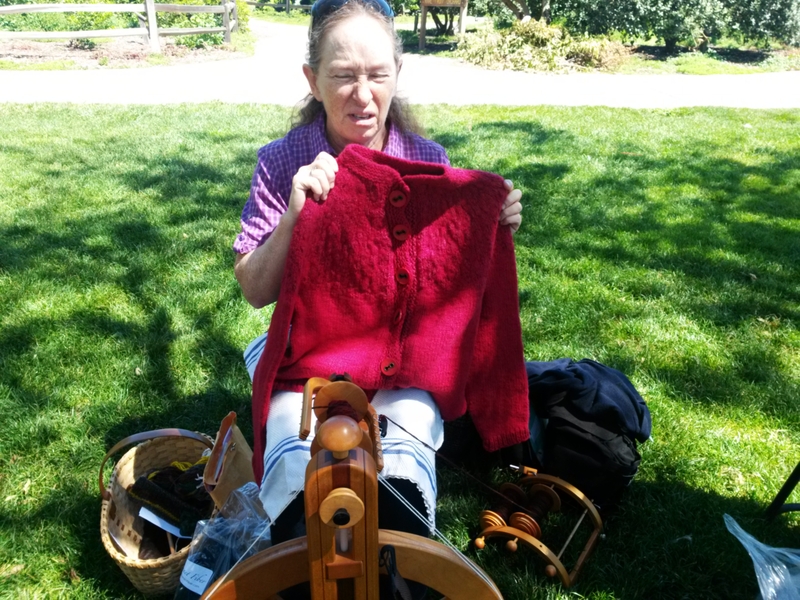 Ginger was spinning gray long wool — maybe a Lincoln cross, maybe some well aged Cotswold. 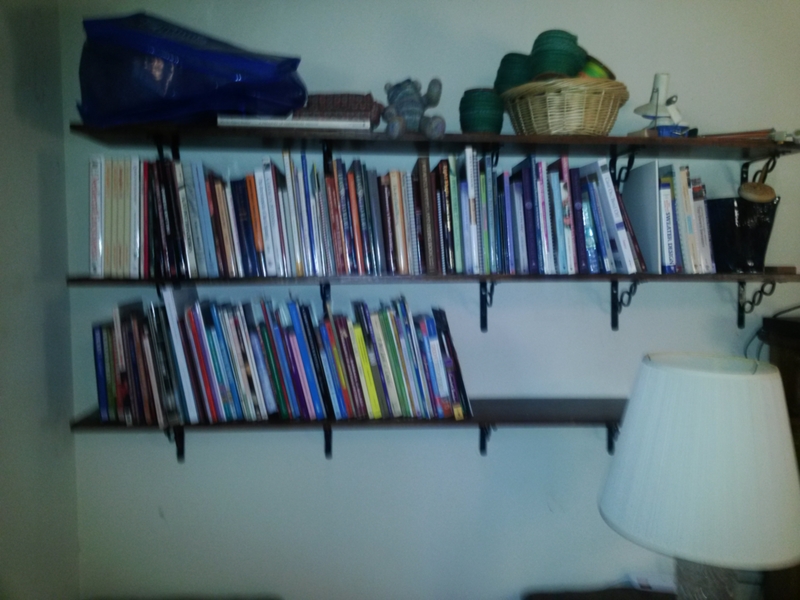 Ginger just got shelving up in her craft room. She gathered her fiber related books and magazines. 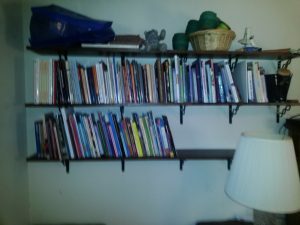 She downsized her collection to just what fit on the shelves. 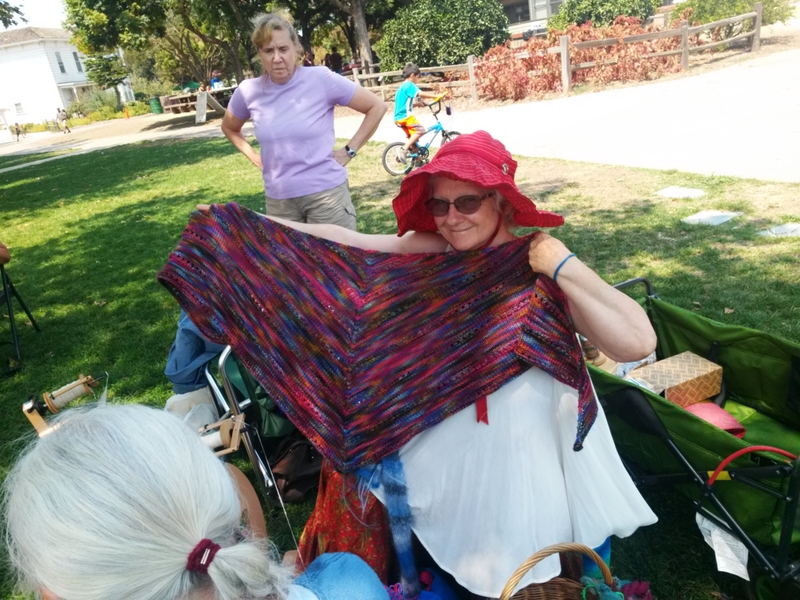 She brought the excess first to the Pleasanton senior center knitting group then to Serendipity. Ange showed us a skein of the gray Wensleydale x Romney yarn that she was spinning at the previous few meetings. As expected, the hand of the yarn is not suitable for anything worn next to the skin. Ange brought a wool/flax blend to the meeting and was wet spinning it. 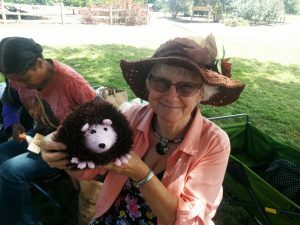 Margaret has been knitting hedgehogs. She showed us one finished hedgehog and one that was knitted and ready to stuff. Margaret just came home from a trip to Ireland. She really enjoyed watching lambs gambol in the green fields. Cookie came with her friend Cheryl (spelling?). Both did an excellent job of picking through Ginger’s offerings and offering a good home to quite a few magazines. Laura was spinning on her big (Navajo?) support spindle. Book recommendation: Laura Fry – The Efficient Weaver — lots of hints on how to warp and tension. This entry was posted in Uncategorized on July 15, 2016 by Aviva Garrett. Aviva called us to order around 11:20 am. The day that we meet in September is Spin-In-Public Day. Ange has visited the website for the event and will investigate getting info about our September meeting added to that site’s list of places to go to see spinners. 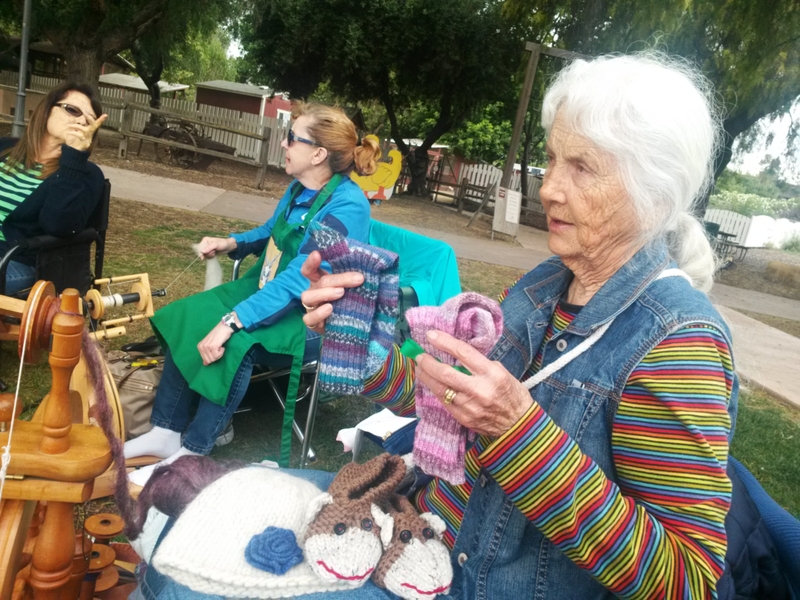 Aviva got email confirming that the Monterey County Fair Wool Auction will indeed be held on Labor Day (Monday) this year. 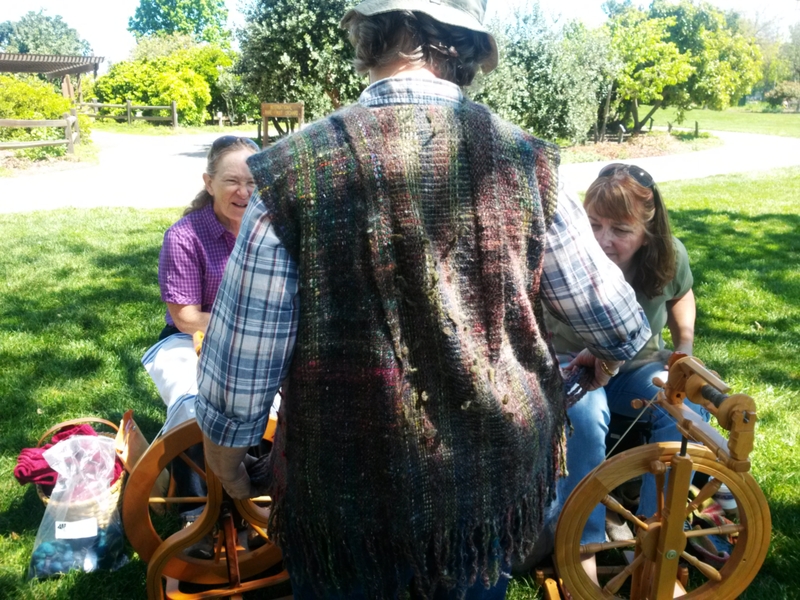 The core group of Serendipity Spinners that are planning to participate in the Sheep-to-Shawl event Oct 1 at Lambtown will be meeting tomorrow. We polled those at the meeting who’d expressed interest to see who was more firmly interested. At this point, Ange will be helping Carol and Ginger spin singles for the warp. Aviva said she’d prefer to only be a backup. The Scottish Games are coming up on the Saturday and Sunday of Labor Day weekend at the Alameda County Fairgrounds in Pleasanton. Lynn helped make arrangements for those that went to demonstrate spinning there last year. She and Carol attested that it is a fun event. It looks like we will probably be less organized for the event this year. Aviva had to leave early. 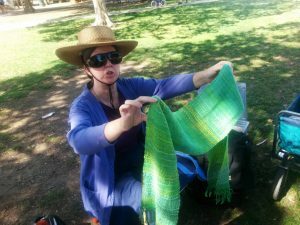 She shows us a towel that she was making. The stripe of darker color in the photo was dyed using Osage orange plus iron. The yarn is a merino/angora blend. Ange is continuing to spin gray Wensleydale X Romney fiber. 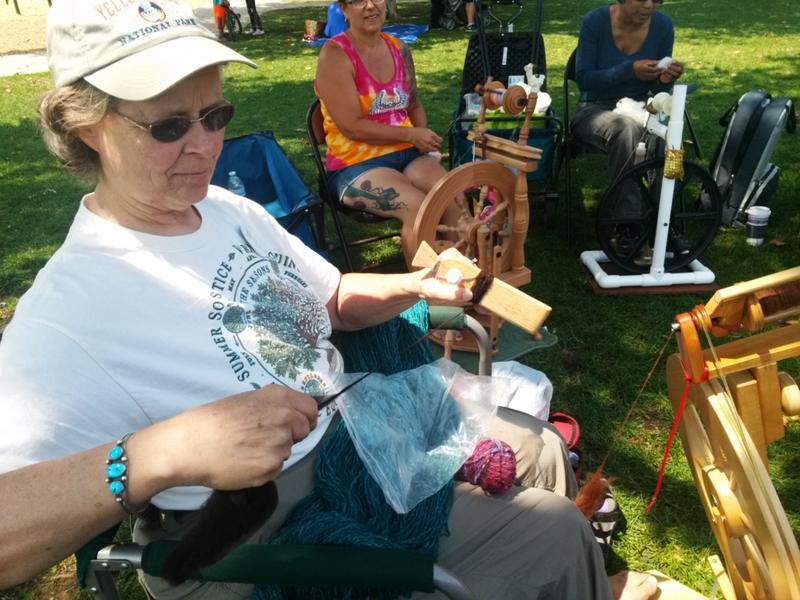 Patti finished spinning her brown merino. She is now spinning natural white wool purchased to spin at her church’s yearly Bethleham reenactment. 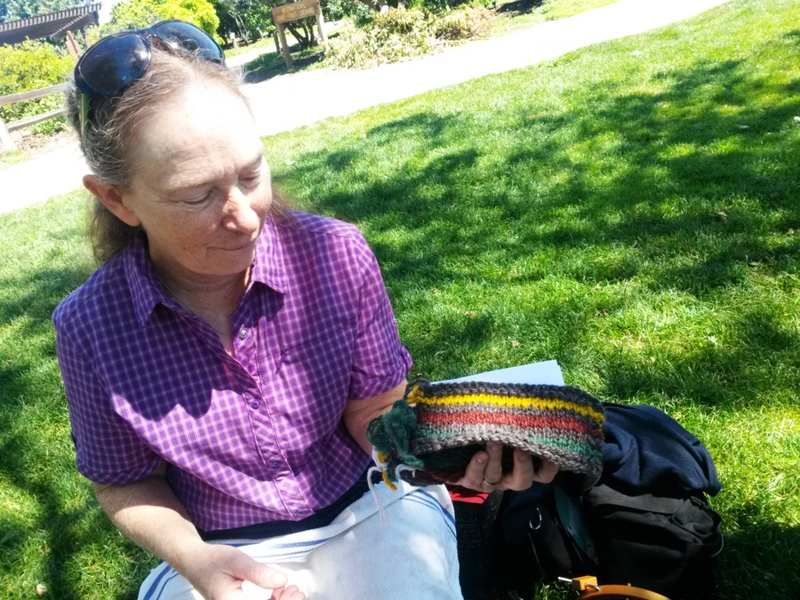 Patti is also practicing her new skill of crocheting. She made quite a few more granny squares from her handspun gold and white yarns. Laura is spinning on her big support spindle some Suffolk fleece that she got as a freebie a couple of meetings ago and dyed brown (photo). 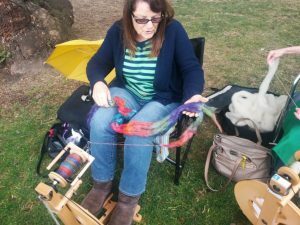 Laura has also been weaving and spinning at home. 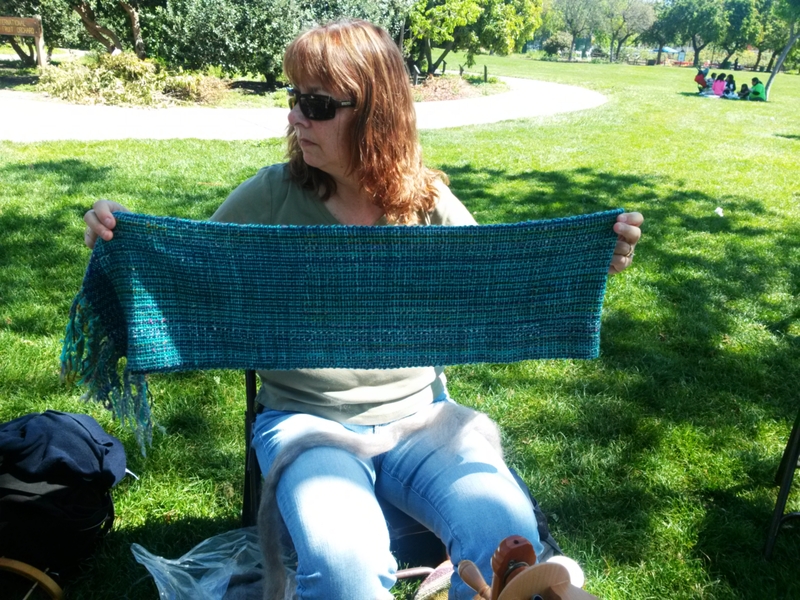 She finished spinning a couple of balls of blue variegated “fat yarn”. 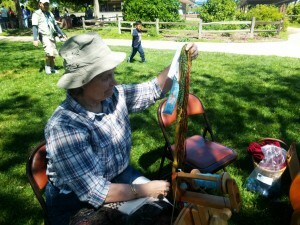 At the meeting, she showed us a recent weaving project. Kelly picked up a bit too much fiber at Ginger’s fiber giveaway last fall. She brought the excess to the meeting to give away. 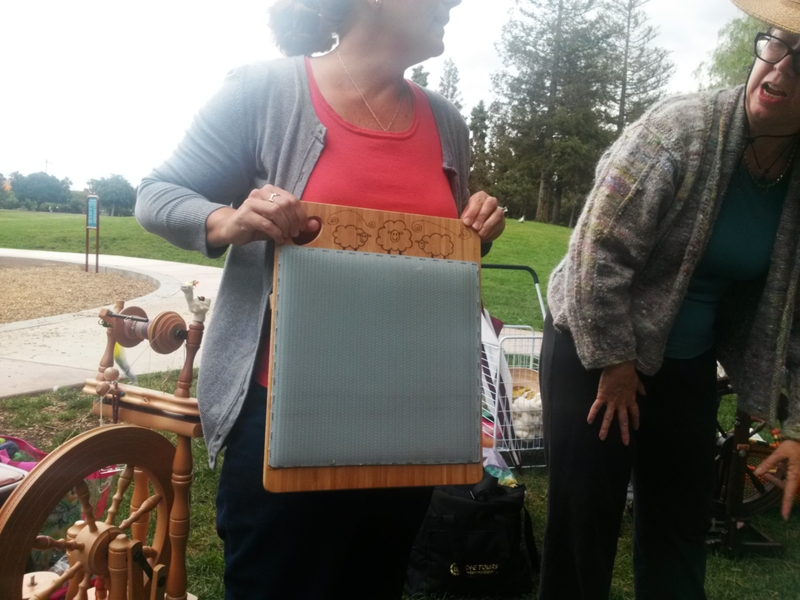 Kelly showed off the blending board that she made from a cutting board, following the general blending board design that Cookie used to make her blending board. Kelly decorated her blending board with a sheep design, using wood burning. Karla showed up for the first time at Serendipity. She is a new spinner. She is a new spinner that learned at a workshop in Arizona. 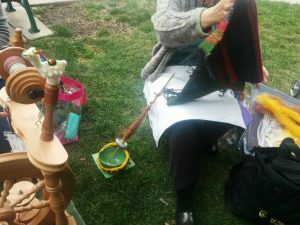 At the meeting, she was spinning yarn on a large support spindle to add a bit more twist so that it work better for a weaving project that she has in mind. Ginger has started in on decluttering her garage and so hasn’t had much time for spinning at home. 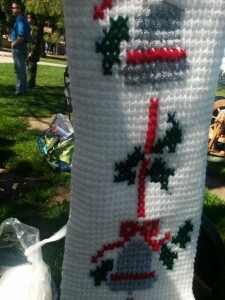 Nancy Derham has been busy because May is a birthday month in her family. Two daughters have May birthdays. Nancy showed us two pair of socks she finished knitting. 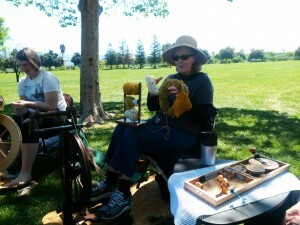 Nancy has also started knitting a replacement pair of skippers for her Japanese son-in-law who lives in Pennsylvania. The pair Nancy gave him as a gift in January already has big holes. 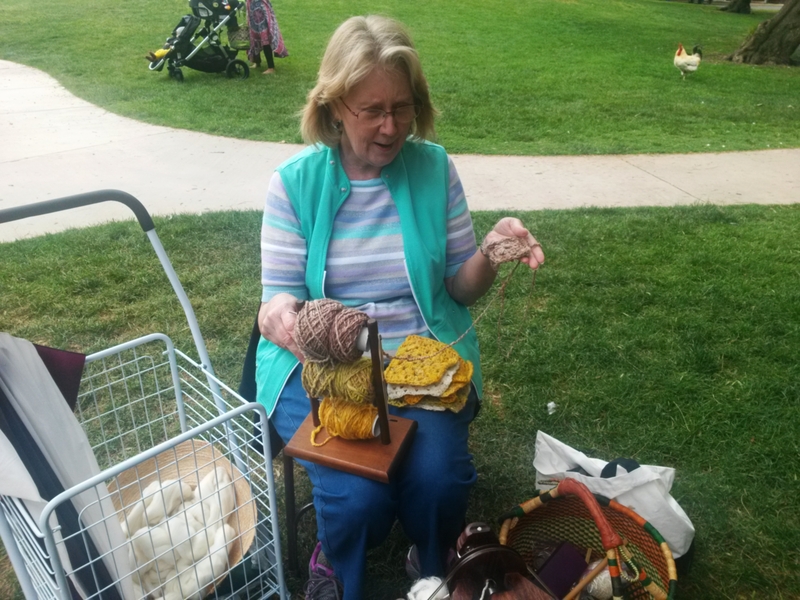 While Nancy visited Pennsylvania in April, she found a hat knitted from very soft spun yarn or roving at a thrift store. Nancy bought it for $1 and dolled it up with a flower. Nancy is spinning some pretty but not very soft dark violet. Carol is trying to spin through her “archives” in her garage. She is currently spinning from a box labelled 2004. She’s been watching Netflix as she spins. Her recent non-hand-spinning project is a knitting project working up some souvenir yarn Carol bought while visiting a friend in Liverpool. 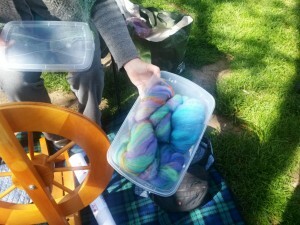 Sharolene is spinning multi-color yarn from fiber she dyed. 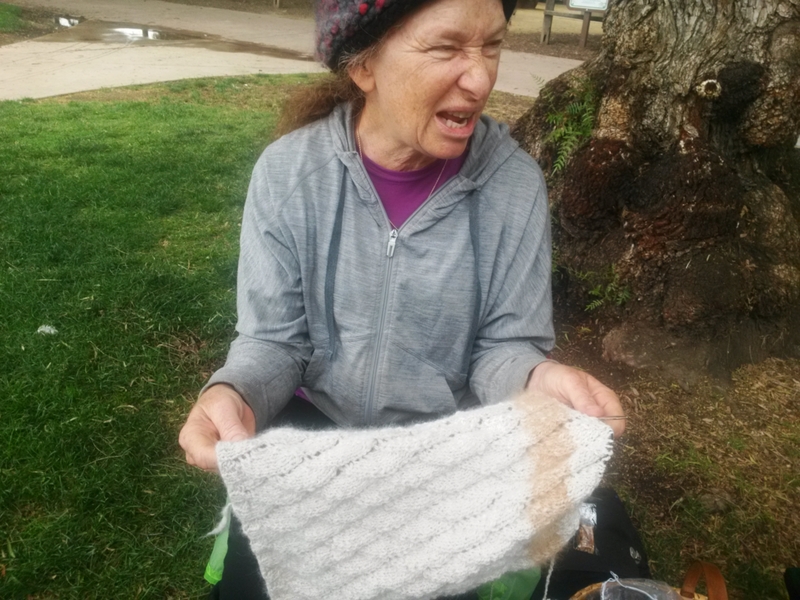 Sharolene thinks the fiber is probably a wool/silk blend dyed in a Nancy Finn class. 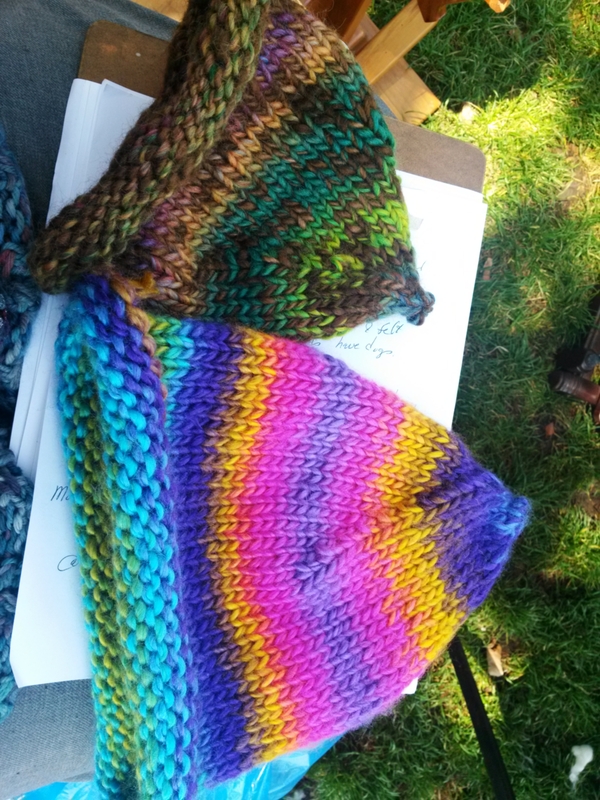 Sharolene and a friend took a warp dyeing class in Columbia a couple of years ago. They dyed bast fiber. Sharolene used the left over dye to dye cotton balls that had been soaked the night before in mordant. 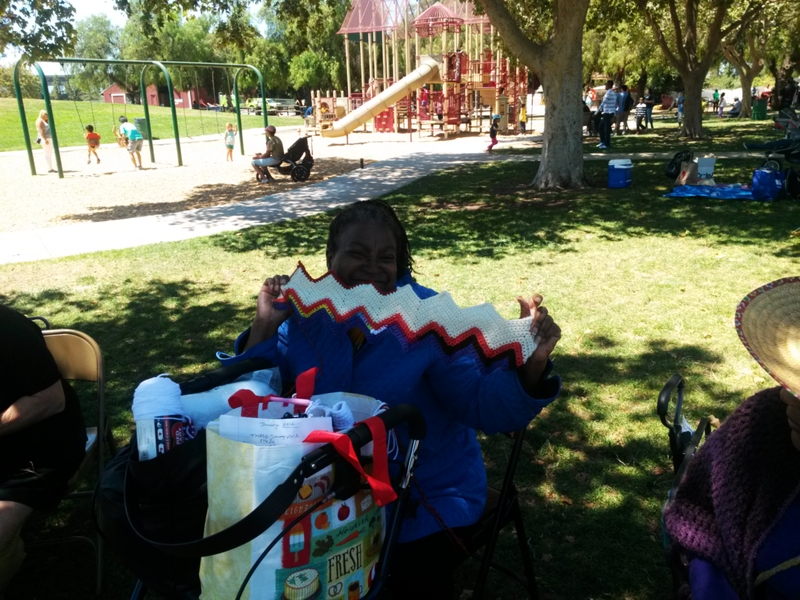 Sharolene has also been busy weaving. She made a tuck lace piece. She brought and showed us a sampler. She has multiple yards of that hand woven tuck lace at home. It is woven from yarn that she got at Jean Shoe’s estate sale. The Mt. Lassen Fiber Guild is having their 5th annual Fiber Fusion event October 8-9 2016 at Historic Patrick Ranch and Museum — 10381 Midway, Durham CA. That is about 2 miles south of Chico. There is a $5 admission and free parking. This event features a fiber marketplace, spinning and weaving demos, yarn and textile competitions, a sheep dog trial, some free mini workshops, and children’s activities. It runs 10 am – 5 pm on Saturday Oct 8 and 10 am – 4 pm on Sunday Oct 9. For more information, visit www.Fiber-Fusion.org. to the fine fiber end products. 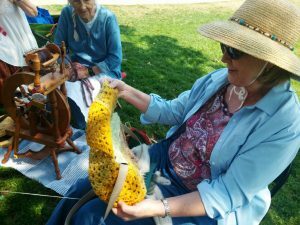 The show will also include Angora rabbit and sheep shearing demonstrations, a fiber arts show, vendors and the famous spinning competition and much more. Ange showed us yardage she made for CNCH. She brought together her stash of small balls of handspun from assorted classes, etc., arranged to them to distribute the main colors, and wove them at a sett of 8 epi. Ange spent the meeting spinning a gray/brown Wensleydale x Romney fleece that had been pin drafted at Morro Bay. Aviva had a red handspun sweater that she knitted up in a red-on-red Fair Isle pattern. After carefully cutting her steeks and taking them down, she put it in the washer for a short time to finish. Unfortunately it shrank about 3 inches and no longer fits. One lesson she learned: her instructor on making steeks said that it doesn’t matter what thread you use to sew your steek. Aviva used brown on her red sweater and it did show. When the cardigan is unbuttoned, the steek can show. 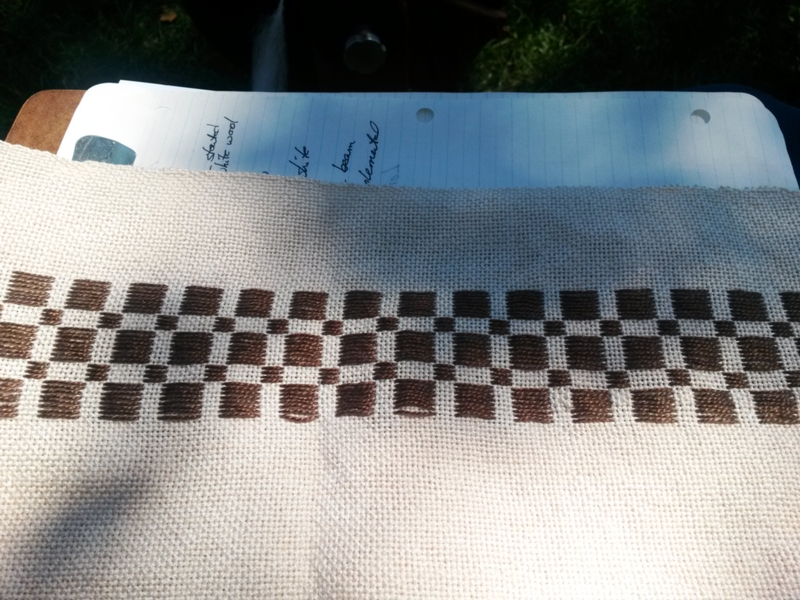 Aviva hid her brown thread by putting down a sewing tape to hide the brown. 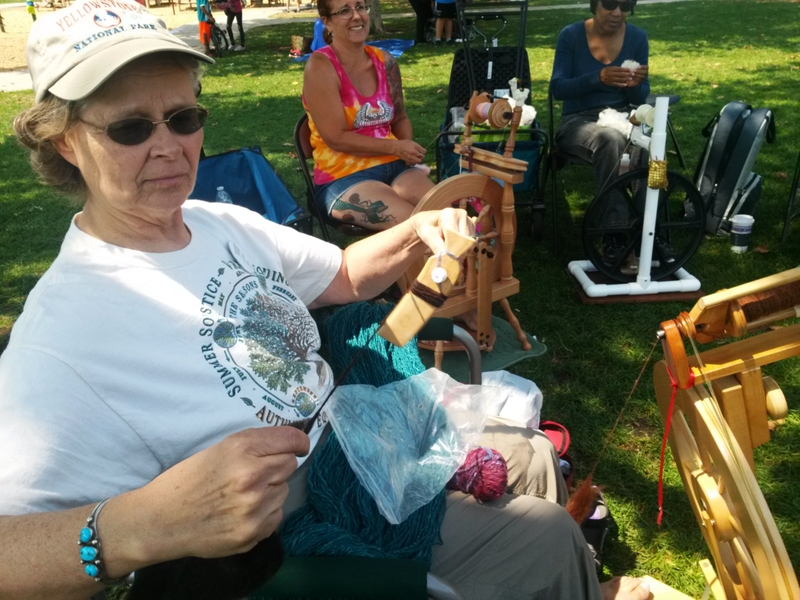 Aviva is starting to spin some blue fiber that she got from Abstract Fiber at Stitches. She’s planning to make a white sweater with blue and red stripes. Aviva ordered a pocket wheel. This is a tiny, 6 pound wheel that fits into a fairly small bag. It features direct drive and has pedals. It works with several kinds of common bobbins, including those for Ashford wheels. The Pocket Wheel ships with just a spindle. There is quite a waiting list. Aviva thinks she’ll get hers in about a year. Lotus also has an order in for a Pocket Wheel. 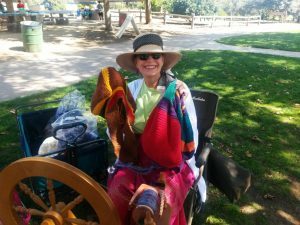 She got a lot of information about the wheel from the Pocket Wheel group on Ravelry. The wheels start at $600. The cost goes way up if you order one made from exotic woods. Lotus showed us her Return to Sender project for CNCH. She fought colors that bled and struggled to work with colors that she felt were ugly. She did get a blue ribbon, though, for her mix of yarns that in total met the threshold of 50 yards to qualify for the contest. Lotus entered a multi color vest into the CNCH fashion show. She finished the vest on Monday — just ahead of the CNCH start on Thursday. She added interest by deliberately exposing the selvages on the back and weaving in some thrums. The vest has a false dart to make the shoulder sit right. It is woven from singles. 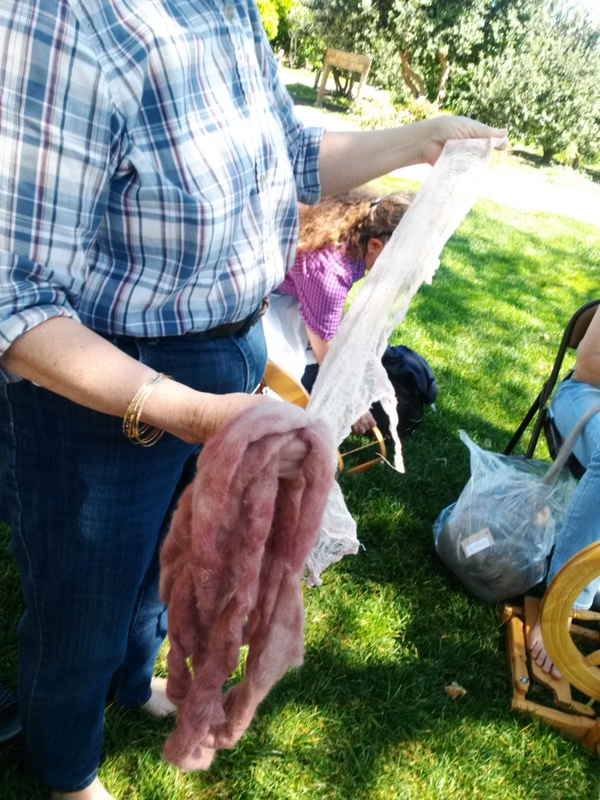 Lotus experimented with dying wool with avocado peels. She put the peels and wool into water then simmered for 1.5 to 2 hours. She said that it is OK if you have some seed too. Her white wool turned a brownish pink color she called “Old Rose”. Lotus’s final show & tell item was a weaving project from a class she took: Weaving with Supplemental Warp. The brown square pattern was made by laying a supplemental wrap on top of primary white warp that was wound onto the beam. She used a stick to keep the brown warp draped off the back of the loom from mingling with the base white warp. 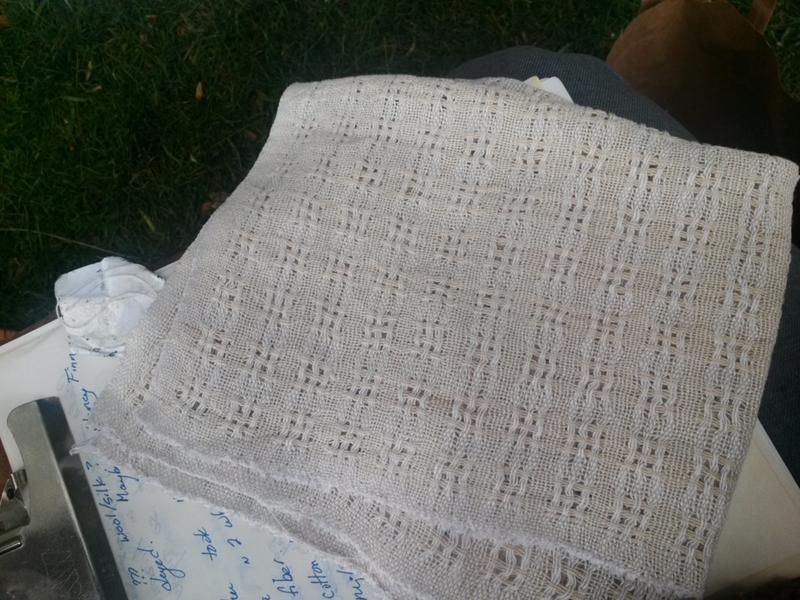 The project was woven from 5/2 cotton. 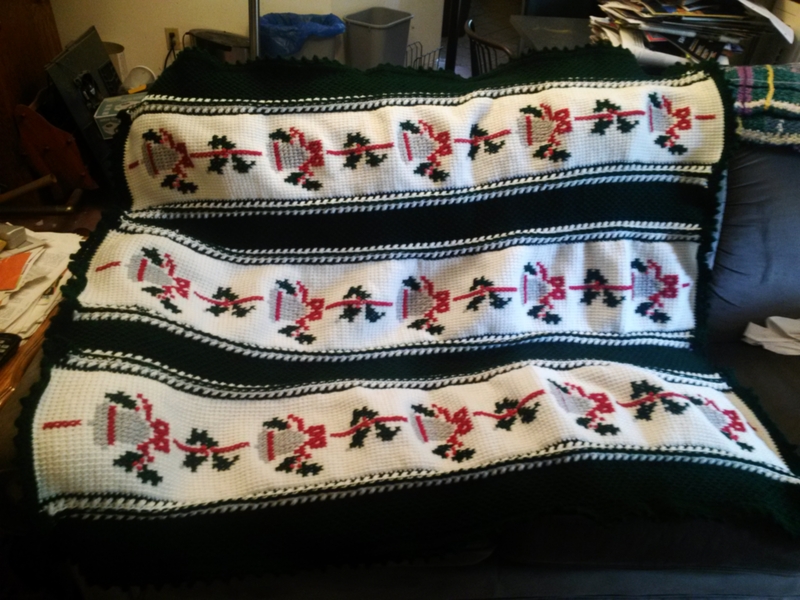 Ginger finished a (non-handspun) crochet project — a Silver Bells afghan made with Tunisian crochet panels and cross stitch design. Lynn is going to be a grandmother again. She made a baby blanket with a simple center and a feather & fan stitch on the outside. 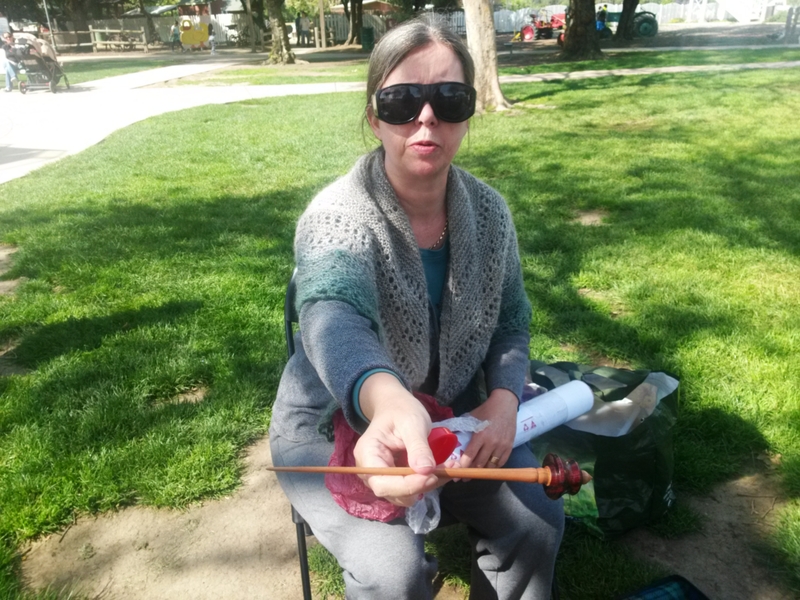 Lynn has ordered a larger charkha — the Bosworth charkha. It is due to arrive this fall. Lynn will be sending out email to kick off our attempt to organize for this fall’s sheep to shawl event. We’ve got openings on the team that competed last year because Lotus wants to rest the day after she gets back from vacation instead of competing. This is the first Saturday in October. If enough people are interested, we’ll field two teams. Patti went to stitches and took classes on how to knit and how to crochet. She finished spinning and plying the fiber she received at our Christmas gift exchange. She has been crocheting squares. So far, she has white and gold squares. 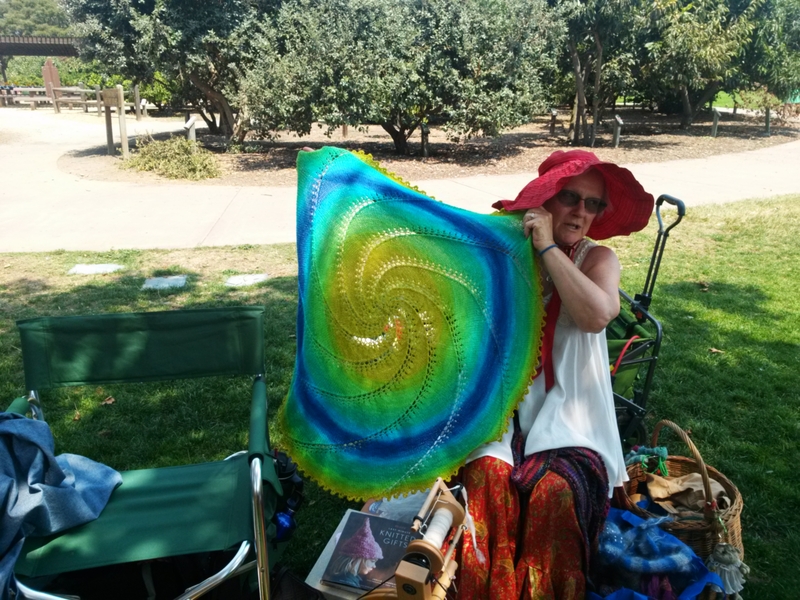 Patti decided that the crochet shawl she’d been planning to do was just too big and complex a project for a beginner so she’s making squares that she can later combine in some way. Patti feels she’s made a lot of progress, especially at being able to spot her mistakes and figure out what to fix or compensate. Jennifer came late and almost missed show and tell. She spun up 4 full bobbins and made a scarf on one weekend binge. Jennifer started knitting a year ago. She is planning to bring her finished objects but so far, is doing better at starting projects. Right now she has 2 shawls, 1 blanket, and 1 cape all in progress. Jennifer has also been busy with Ajax. She and Ajax have been invited to an extended Renaissance event. Jennifer toured a fiber mill. She learned a lot about the financial aspects of running a mill. The mill was outside of Davis but the notes taken at our April meeting didn’t include the name of the mill. On the topic of fiber mills: Lotus reported that a new mill is opening just south of Ukiah. Lotus didn’t know its name. Cookie arrived even later than Jennifer. 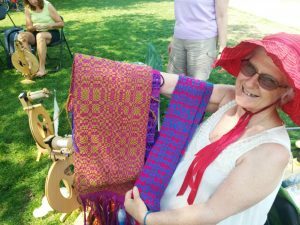 She modeled a handspun silk scarf she’d made. FYI: Cookie tipped us off to an event to be held at Ardenwood the day after our April meeting. This entry was posted in Uncategorized on May 14, 2016 by Aviva Garrett. The weather was good enough to let us meeting outside. Aviva called us to order. Nancy reported that our balance as of February 23 was $564.18 based on her calculations. Nancy had not received the latest bank statement from Lotus yet so the balance has not been reconciled. Several of our members signed up to demonstrate at Hidden Villa on April 2. Cookie and Nancy Derham were the meeting attendees who’d signed up. Cookie went to a workshop by the owner of Meridian Fibers. She got lessons on how to skirt fleeces, as well as on sheep husbandry. Cookie shows us samples of the brown, gray, and white fleece she got at the class. Half of each sample had been washed and the other half left in its natural, greasy state. 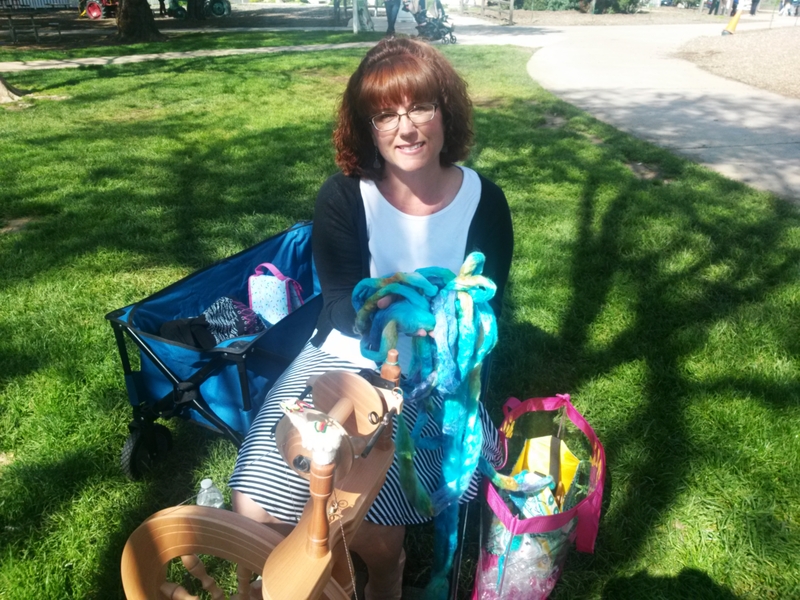 Laura unwrapped an 11″ support spindle she’d just received from someone on Ravelry who had been working hard at stash reduction. Laura has been working this past month on an old Clemes & Clemes drum carder. She has cleaned it and used epoxy to fix the worst of the damage. 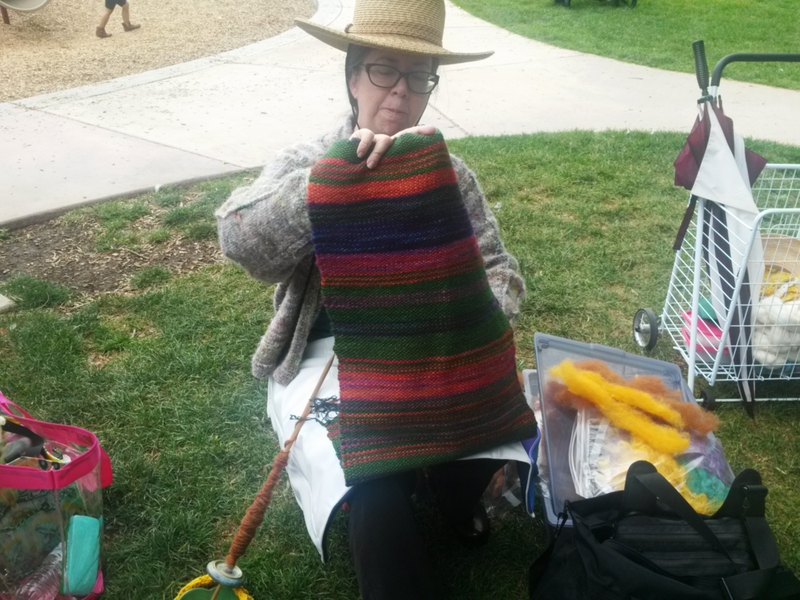 She showed us some Easter colored batts from her now well-behaved carder. Laura has been using toilet paper rolls to hold the singles she winds off from her spindles. Her latest prize is half an ounce of guanaco. Inspired by Cookie, Kelly bought a cutting board, used wood burning to decorate it with sheep, and bought carding cloth. Kelly has not yet fully assembled the components into a carding board. Kelly got dowels to doff fiber from her board at Home Depot. The folks there have a service for cutting dowels and boards to size. Kelly is spinning a silk / merino blend she bought at Stitches from a vendor named Lisa. Nancy learned the Magic Knot technique — or perhaps more accurately, has succeeded a couple of times and is just beginning to work on getting it down pat. This is an old technique used to join threads and yarns. If done well, the knot is barely findable. You can even cut off the ends and the knot will stay. Nancy spotted a fellow sock knitter in a waiting room at Kaiser using the technique to make stripped socks the hard way (i.e. not with self striping yarn). Nancy found instructions for the technique on-line and is working to learn how to do it. 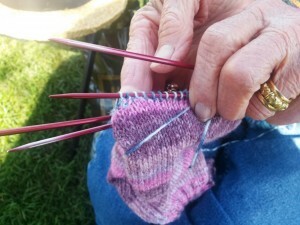 She demonstrated following directions to make a knot in the pair of socks she was knitting. 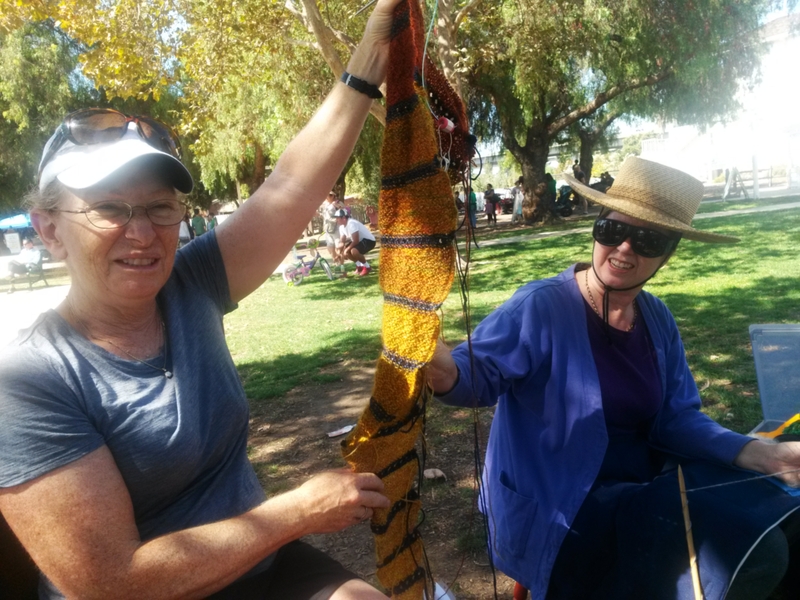 After knitting a row or two more, she managed to find the knot again for a phot. 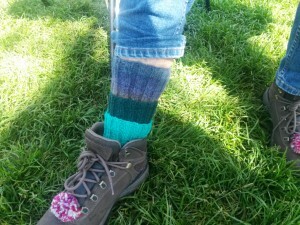 Nancy wore her finished pair of multi-cuff socks. Aviva was spinning some mystery batts made some time ago at one of our mystery batt meetings. She is planning to give them to a woman that knits stuffed dragons for babies. Aviva, too, went to Stitches and did a pretty good job of restraining herself. She came home with yarn for two projects plus a modest amount of fiber. The fiber was from a vendor, Abstract Fiber, that Aviva knew from a previous encounter at Blacksheep Gathering up in Oregon. Aviva fell for a bag of yak/merino blend and a couple of other small bags of yummy fiber. Sharolene knitted a garment — a snood? — for a friend. This is a garment that one wears pulled down around the shoulders. 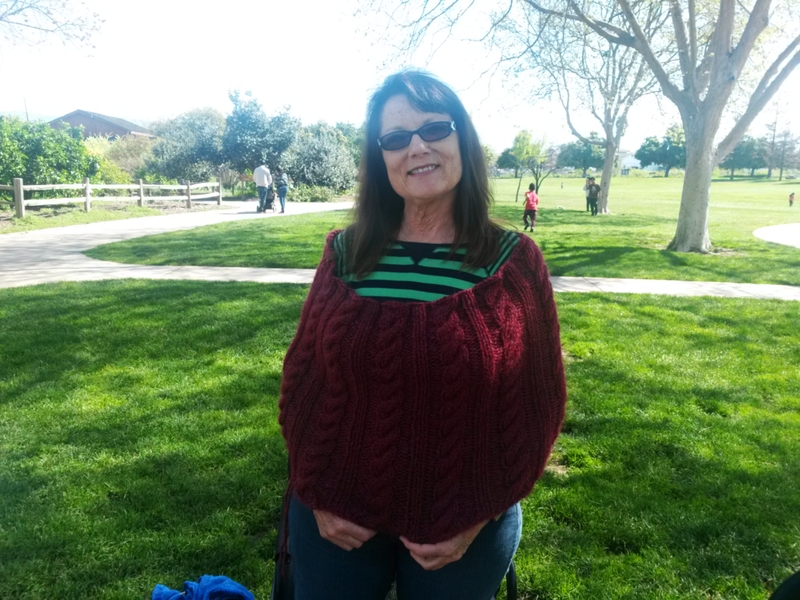 After ad libbing a pattern, Sharolene learned that normally such a garment has shaping at the top to help it stay in place. She plans to retrofit it with ribbing as soon as she can settle on a pretty design that will mesh with the existing cable pattern. The snood was knit from alpaca. 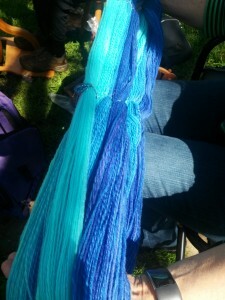 Sharolene also showed us some beautiful yarn spun from multiple shades of blue. She started with 4 colors and mixed half of each with its neighboring colors. She spun this Polwarth into the skeins. 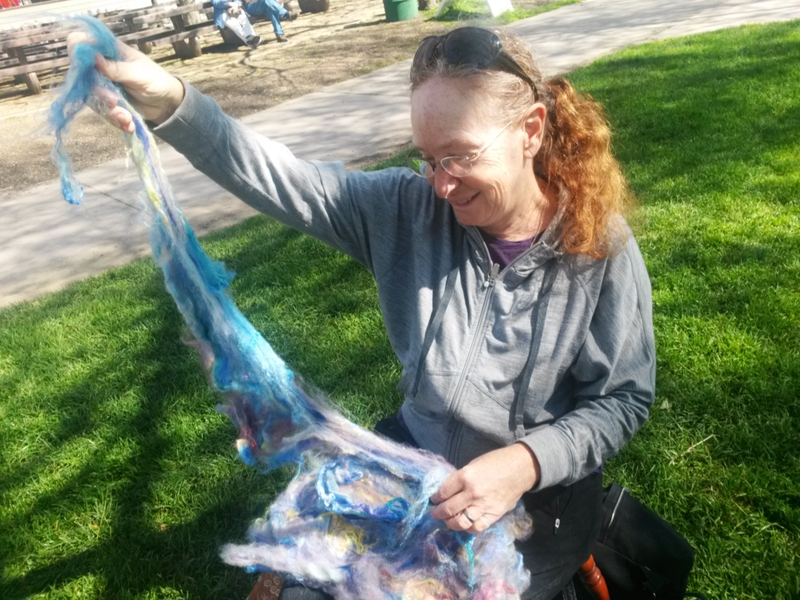 Sharolene also fell for some of the lush fiber from Abstract Fiber at Stitches. She got a silk/yak/merino blend. She has already blended lots and spun up some red/purple/black yarn. Ginger didn’t do much spinning over the past month. She’s back to sorting and decluttering. She is working on a Christmas season themed afghan made from commercial yarn. This entry was posted in Uncategorized on April 15, 2016 by Aviva Garrett.